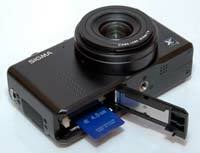 The Sigma DP1s is a new revised version of the two-year old DP1 large-sensor compact camera. The DP1s features exactly the same APS-C sized Foveon sensor and 28mm f/4 prime lens as its predecessor, but offers two operational enhancements inherited from the Sigma DP2. These are improved performance when shooting backlit subjects and the ability to to allocate the new QS (Quick Set) function to the digital zoom buttons, as featured on the DP2 and SD14 cameras. In all other respects the DP1s is identical to the original DP1, sharing the same 14.06 megapixel Foveon X3 sensor, 2.5 inch LCD screen, full range of creative shooting modes, built-in flash, external hotshoe and RAW format support. 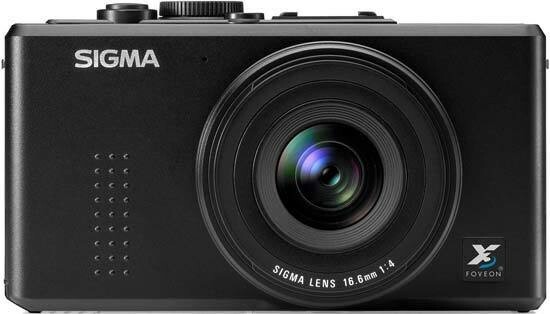 The Sigma DP1s is available in black and retails for £549 / $649. As the DP1s and DP1 are outwardly identical, a lot of the comments that we made about the DP1 will be repeated here. 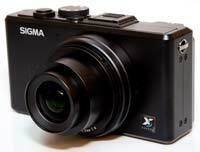 The Sigma DP1s has a substantial, serious design that is rather box-like but not altogether unattractive. Measuring 113.3(W)×59.5mm(H)×50.3mm(D) and weighing 250grams, the Sigma DP1s fits into a coat pocket or small camera bag, but it's too big and bulky for a trouser or shirt pocket, primarily because of the lens housing which protrudes quite a long out from the front of the camera body. The DP1s becomes even more cumbersome if you add the optional optical viewfinder or lenshood. Utilising an aluminium alloy body, the DP1san exceedingly well built camera, certainly up there with the best that the other manufacturers have to offer. The DP1 has an under-stated, all-black appearance, and together with the slightly heavier weight this lends the camera a professional look and feel. The all-metal tripod mount directly inline with the centre of the lens is a giveaway sign that this is intended to be a serious camera (most compacts have a plastic mount squeezed into one of the corners). The 28mm, F/2.8 lens dominates the front of the camera. Sigma, with its long history of making lenses for other manufacturers' cameras and more recently its own DSLRs, has developed this lens specifically for the DP1 and DP1s. Despite offering a fixed-focal length, the lens extends by approximately 3cms when the camera is turned on, accompanied by a quite audible mechanical noise. The construction of the lens feels rock-solid with no play at all in the metal lens barrel. Obviously the 28mm lens will immediately put a lot of people off the DP1s. With no zoom lens model on the horizon, you're left with a choice of the DP1s or the DP2 which has a 41mm lens. 28mm is perfect for wide-angle shots, so if you're a fan of land and city scapes, or you're happy to get up close and personal, the combination of the DP1's lens and every photographer's constant companion, their legs, proves to be more versatile than you might first think. The maximum aperture of F/4 is slower than many photographers might have wished for, especially given the lack of an anti-shake system, but it's perhaps understandable given the relative physical size of the lens and the camera body, although bear in mind that the DP2 offers a faster maximum aperture of F/2.8. Also on the front of the DP1s is a small dimpled area to the left of the lens (looking from the front) which helps you to keep a firm hold, replicated on the rear below the digital zoom buttons. The 2.5 inch LCD screen is a good compromise given the size of the DP1s, being small enough not to overpower the rest of the design, but large enough to easily frame and review your images. It displays 100% of the image and the 230,000 pixel resolution is adequate, plus there are a couple of options for increasing or decreasing the brightness of the screen if you don't like the default setting. If you'd prefer using an optical viewfinder to frame your images, Sigma offers the optional VF-21 viewfinder, which fits into the flash hotshoe on top of the camera (you can also use other third-party viewfinders with the DP1s). This system does give you a choice, but it comes at the cost of not being able to use the optical viewfinder and an external flashgun at the same time, and also the hefty literal cost of £115 (significantly cheaper if purchased in kit form with the camera). The VF-21 is a very tight fit in the DP1s's hotshoe, so there's no danger of it falling off, although it's small enough to misplace when taken off the camera. As for performance, Sigma's viewfinder solution offers a large, bright view of the scene in front of you. On the other hand, it doesn't provide any feedback to the photographer, other than showing a thick white border which indicates very approximately what part of the scene the DP1s will capture. I found that the recorded image was quite a bit bigger than this border, and also that it disappeared against a bright background, effectively making framing your subject a point and hope experience. Also the only way of knowing that the camera has focused correctly is the small green LED above the LCD screen, which you can just see out of the corner of your right eye when looking through the optical viewfinder. At the heart of the Sigma DP1s is the APS-C-sized Foveon image sensor. The exact size of the image sensor used in the DP1s camera is 20.7mm x 13.8mm, which is approximately seven to twelve times larger than the 1/1.8inch to 1/2.5 inch image sensors used in most other compact digital cameras. Sigma are still the only manufacturer to use the Foveon X3 sensor, and as with the SD14 DSLR camera, they quote the resolution as 14 megapixels. Whilst this is technically true, in that there are 14 million pixels on the sensor, it's very difficult to compare it with a conventional Bayer CCD/CMOS sensor. This is because the Foveon solution uses 3 layers of 2652×1768 pixels, stacked on top of each other, with each photodiode capturing all of the RGB data. Sigma and Foveon claim that this results in better looking colour images straight out of the camera when compared to a CCD/CMOS sensor. Whilst this may be true, from the user's point of view the final image is 2652×1768 pixels in size, a little smaller than a 5 megapixel photo, which limits how big you can print or crop the native image without interpolating it in Adobe Photoshop or another application. Just like a DSLR, the DP1s offers both JPEG and RAW recording formats, one of a handful of compact cameras to do so. There are 3 different JPEG compression levels, and a choice of four sizes including a 16:9 widescreen mode. The RAW files are saved in the Sigma X3F format, which can be processed using the supplied Sigma Photo Pro RAW image developer, Adobe Lightroom and Photoshop CS4, Capture One, Bibble and other third-party RAW developers. Sigma Photo Pro is a simple and straight-forward application that doesn't compare that well with Lightroom or Photoshop in terms of features, but gets the job done and is free of charge. Unfortunately, as with the original DP1, the DP1s has a real problem with recording RAW files, taking around 7 seconds to store them, during which the camera can't be used. Sigma are marketing the DP1s as a real DSLR alternative or backup camera, and that's what the majority of users will be shooting in, so you'd expect it to offer DSLR-like performance for processing RAW files. There's even a 2 second lockup when shooting in JPEG mode at full-size, despite using a SanDisk Extreme Ducati Edition SDHC card with read/write speeds of 20 MB/second. When you factor in the slow auto-focus system (more on this below), this makes the DP1s ill-suited to quick moving subjects (or in the case of RAW mode, any moving subject). The start-up time from turning the Sigma DP1 on to being ready to take a photo is quite slow at around 3 seconds. In the fastest Continuous mode the camera takes 3 frames per second for an unlimited number of images at the highest JPEG image quality, and commendably in RAW mode too, which is very good for this class of camera. Unfortunately, the DP1 locks up completely for around 10 seconds when shooting a burst of Fine JPEGs and even longer for RAW files, so while you can certainly capture 3 JPEGs or RAW files in a second, the camera is effectively out of action for the next 10-15 seconds. The Sigma DP1s offers a full range of advanced exposure controls, including aperture-priority, shutter-priority, manual and manual focusing, with Auto and Program AE modes catering for the less experienced. There are no auto-everything or scene modes on this camera, which is a veritable breath of fresh air at a time when most manufacturers are stuffing their cameras full of clever technologies that take control away from the user. The aperture or shutter speed are set by using the Zoom In / Zoom Out buttons, with the left and right buttons on the navigation pad setting the aperture in the Manual shooting mode and exposure compensation in the other modes. Not the most elegant of systems, but it gets the job done. The main new addition to the DP1s is the Quick Set menu, borrowed directly from the Sigma SD14 DSLR and the DP2. You can assign this to one of the zoom buttons, and it provides quicker access to eight key features - ISO, Metering, White Balance, Flash, Image Size, Burst Mode, Colour Mode and Image Quality. There are four options on each of the two QS screens represented by icons, with the QS button toggling between the two. The navigation pad keys are then used to select the various options for each feature. It sounds complicated on paper, but quickly becomes second nature to use, and is a very welcome addition to the DP1s. The DP1s has three metering modes, Evaluative Metering, Center Weighted Average Metering and Spot Metering. I found that the DP1s got exposures right 95% of the time when using the Evaluative Metering mode, with Spot Metering useful for the remaining 5%. The DP1s promises improved performance when shooting backlit subjects, but I didn't notice too much difference in the exposures from the DP1s, which still tended to leave the main subject a little under-exposed. Exposure compensation can be set in 1/3 stop increments from +3.0 to -3.0 stops and a simple auto bracketing function is also available. Focusing is one of the weaker points of the DP1. There are 9 focusing points to choose from, but you can only select one at a time, with no multi-AF point system that virtually all other cameras have. You have to go into the menu system and scroll down the long list of options to change the AF point, which slows down the camera operation and soon becomes irritating. It's easier and quicker to set the focus to the middle point, then focus by half-pressing the shutter button and recompose the frame for off-centre subjects. The DP1s offers a rather confusing choice of focusing options, with two autofocus modes available. The normal mode has a focusing distance from 50cm to infinity, but it's also possible to shorten the minimum focusing distance to 30cm using the second mode. I didn't notice any speed difference between the two modes, so permanently set the DP1s to the 30cm short mode. Finally, the DP1s's autofocus system isn't what you'd call snappy, especially in low-light. It always locks onto the subject eventually, but there's a noticeable delay that doesn't make this camera particularly good for action photography. Note that the DP1s also doesn't have a built-in focus assist lamp. Manual Focus is also available, which obviously avoids the auto-focus lag and speeds up the camera. The DP1 has a dedicated manual focus dial located above the digital zoom buttons on the rear of the camera, with markings indicating 0.3m, 0.4m, 05m, 07m, 1m, 2m, 5m and infinity. The dial rotates freely with no lock at the various distances, so it's easy to set the distance, put the camera in your pocket, and then find that the dial has moved to another position. It is possible to magnify the LCD display to check the focusing by pressing the Display button, although this doesn't provide enough magnification or clarity to ensure precise focus. 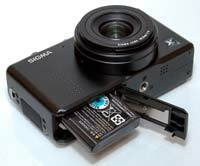 The Sigma DP1s offers two flash solutions, the built-in pop-flash unit which is positioned above and to the right of the lens, and an optional flashgun which fits in the external hotshoe directly above the lens. The pop-up flash is opened via a switch on the back and isn't very powerful, with a guide number of 6 and a range of 30cm-2.1m at ISO 200. On the upside it does feature flash exposure compensation in 1/3 stops increments for more precise control. Sigma suggest that you use the optional EF-140 DG external flashgun with the DP1, but again there are compatible third-party alternatives available. A dedicated lens hood is the final optional accessory for the DP1s. This blocks out extraneous light and helps avoid flare, useful given the wide-angle nature of the lens, although unfortunately we didn't have one to test. The lens hood also includes a hood adapter which is designed to accept a 46mm lens filter, so you can add things like a polarizer, UV or close-up macro filter. The closest distance that you can focus on a subject is 30cms away from the camera when it's set to Full Focus mode, so you'll need to buy the lens hood and then fit a third-party close-up macro filter if you want to get really close to your subject. The main menu system on the Sigma DP1s, accessed by pressing the Menu button in the middle of the navigation pad, is rather rudimentary but simple to use. There are two main menus, Shooting Menu and SetUp. Virtually all of the camera's main options, such as image size, sharpness, metering mode and continuous mode, are accessed here, so the Shooting Menu has 14 options spread over 3 screens and the Setting menu has 18 options spread over 3 screens. Due to the large LCD screen and restricting the number of on-screen choices to 7, the various options and icons are quite clear and legible, and each option uses a combination of text and helpful small icon. If you have never used a digital camera before, or you're upgrading from a more basic model, reading the easy-to-read but rather brief 100+ page manual before you start is a must. Thankfully Sigma have chosen to supply it in printed format, rather than as a PDF on a CD, so you can also carry it with you for easy reference in the field. Once you have captured a photo, the Sigma DP1 has a rather limited range of options when it comes to playing, reviewing and managing your images. You can instantly scroll through the images that you have taken, view thumbnails (9 onscreen at once), zoom in and out up to 8x magnification, view slideshows with various configurable options, set the print order, record a soundclip, lock, mark, and rotate an image. The Display button toggles detailed settings information about each picture on and off, such as the ISO rating and aperture / shutter speed, and there is a small RGB histogram available during playback (but unfortunately no when taking a picture). When taking a photo, pressing the Display button toggles between the detailed information, gridlines to aid composition, no information and turning the LCD screen off. In summary the Sigma DP1s is virtually identical to the DP1 in both operation and design, with only the new Quick Set function differentiating between them.